HITS is very excited to announce that Longines will be sponsoring the Longines FEI Nations Cup™ Jumping of the United States of America 2018, as well as the Longines Grand Prix during Week V of the HITS Ocala Winter Circuit at HITS Post Time Farm in Ocala, Florida. Longines has been sponsoring equestrian events since the early 1900s and while their recent show jumping sponsorships include the FEI World Cup™ and the Longines Global Champions Tour, this is the first year they have been the title sponsor of the Longines FEI Nations Cup™ Jumping of the United States of America 2018. The FEI Nations Cup is returning for its fourth year at HITS Post Time Farm and in 2018 will be an FEI CSIO5* event. Featuring the $300,000 Longines Grand Prix and the $450,000 Longines FEI Nations Cup™ Jumping of the United States of America 2018, HITS Ocala Week V will offer over $1 million dollars in prize money. Being added this year is a Nations Cup for Children and Juniors. The competition follows a similar format to the Longines FEI Nations Cup™ and gives these young competitors an opportunity to show at a prestigious level of show jumping. "I am very excited for what this event will have to offer young up-and-coming equestrians. 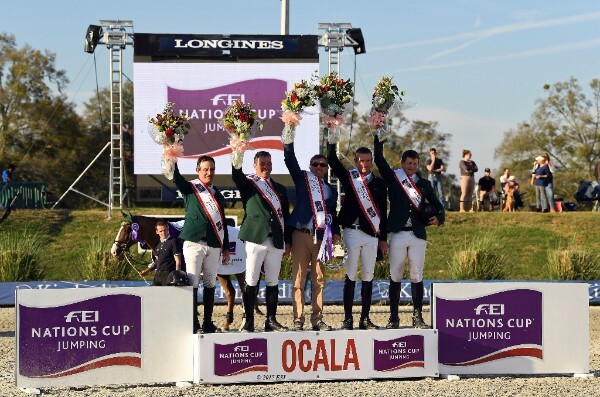 With the finals being in the stadium and all to march in the Parade of Nations, held in Downtown Ocala Square, on Saturday alongside the professionals, it truly is a one of a kind experience for all competitors" says HITS Owner and CEO Tom Struzzieri. This competition will also be held during Week V of the HITS Ocala Winter Circuit. For more information on the Children and Juniors Nations Cup, contact the HITS office at 845-246-8833. Longines was established in 1832 and has dominated the Swiss watchmaking business ever since. They began their passion for equestrian sports in 1878 and partnered with their first international show jumping competition in 1912. Today their involvement in equestrian sports continues in show-jumping, endurance, eventing, and flat-racing competitions. Team Ireland, winners of the FEI Nations Cup 2017 at HITS Post Time Farm. The second annual “Jump Downtown” event will be held in Ocala’s Downtown Square on Saturday, February 17, 2018. Presented by Ocala Main Street, IHMC (The Institute for Human and Machine Cognition), and the CEP (Ocala/Marion County Chamber and Economic Partnership), Jump Downtown will feature a Parade of Nations honoring the countries and the riders participating in the Longines FEI Nations Cup Jumping event, followed by a Celebration of the Horse presentation of the 30-plus horse breeds showcasing the diversity of the “Horse Capital of the World”. Additional festivities on the Square will include snacks, music, horse drawn carriage rides, s’mores, and more! There were over 5,000 spectators for the 2017 FEI Nations Cup™ and the goal is to get even more this coming year. 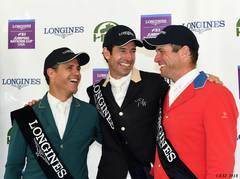 “We are excited to have the opportunity to, once again, host this international event with Longines as the title sponsor” says Tom Struzzieri. The Longines Grand Prix will be held on Friday, February 16, 2018 and the Longines FEI Nations Cup™ Jumping of the United States of America 2018 will be held Sunday, February 18, 2018, both at HITS Post Time Farm in Ocala, FL. Visit www.hitsshows.com for more information regarding the competition.